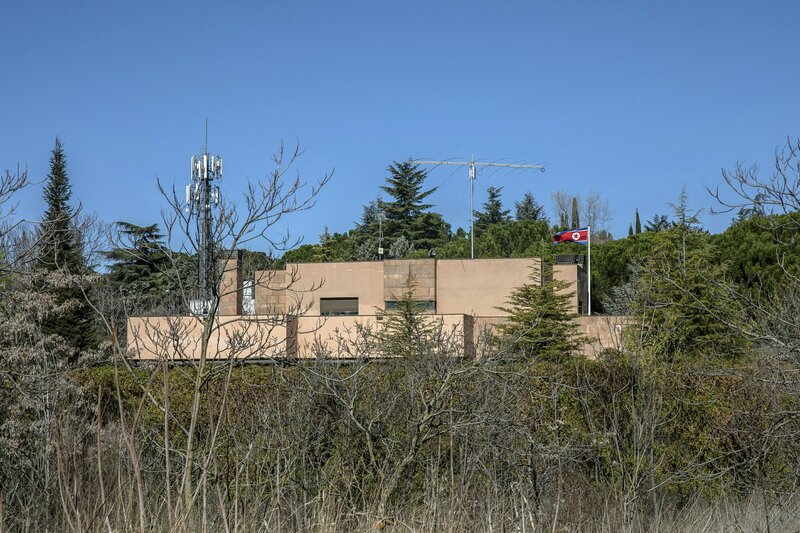 MADRID — A Spanish court on Tuesday accused an American, Mexican and South Korean of being part of a 10-member group that led a mysterious attack on the North Korean Embassy in February, saying the assailants then offered the FBI stolen data from the raid. National Court judge Jose de la Mata on Tuesday lifted a secrecy order in the case, announcing it had found evidence of various crimes, including trespassing, injuries, threats and burglary committed by “a criminal organization” at the embassy in Madrid. No formal charges have been brought at this point in the investigation. The Feb. 22 attack, including a bold escape from the heavily-secured embassy with the assailants carrying away computers and data after having shackled and gagged the delegation’s staff, has been claimed in online posts by the Cheolima Civil Defense — a shadowy group that has the self-declared mission of helping defectors of the North Korean regime. The group also goes by the name Free Jonseon. On Tuesday, the Spanish judge released documents that named the suspects, including Adrian Hong Chang, a Mexican national and resident in the U.S. De La Mata described Hong Chang as the leader of the gang responsible for the attack. Hong Chang escaped from Spain and went to Lisbon before flying to the U.S. on Feb. 23, court documents said. The suspect then got in touch with the FBI in New York four days later and offered to share material and videos with federal investigators, the documents said. The Spanish investigation didn’t say whether the FBI accepted the material. Others identified as part of the assailants’ group were Sam Ryu, from the U.S., and Woo Ran Lee, a South Korean citizen. The suspects’ whereabouts and their hometowns weren’t immediately known. North Korean authorities haven’t officially reported the incident to authorities. Spanish police first found out about it because the wife of one of the embassy’s workers managed to escape by jumping from a window. According to the Spanish judge’s account, Hong Chang was the man who opened the embassy’s door to Spanish police officers who were checking on the woman’s claim that something was going on at the embassy. The assailant, posing as an embassy official, told the police that everything was normal there, paving the way for the group’s escape. The attack’s timing, barely a week before a high-stakes U.S.-North Korea summit on denuclearization derailed in Hanoi, had led many to link it to the North’s former ambassador to Spain. Kim Hyok Chol, who was expelled from Spain in September 2017 following Pyongyang’s sixth round of nuclear tests and missile launches over neighboring Japan, has become the North’s top nuclear negotiator.